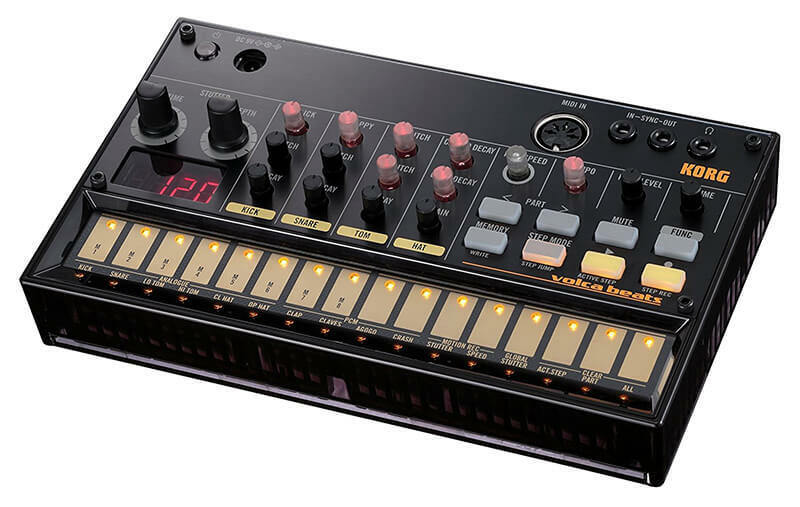 The Volca Beats caused quite a stir when it was released in 2013, offering mainly analogue drum sounds at an unprecedented low price point. It’s a humble little unit, but the sounds pack a punch and the built-in sequencer is simple but effective. It’s not strictly a drum machine, but the excellent Volca Sample is also worth checking out as an alternative; it has the same form factor and very similar sequencer, but allows you to load and manipulate your own samples. 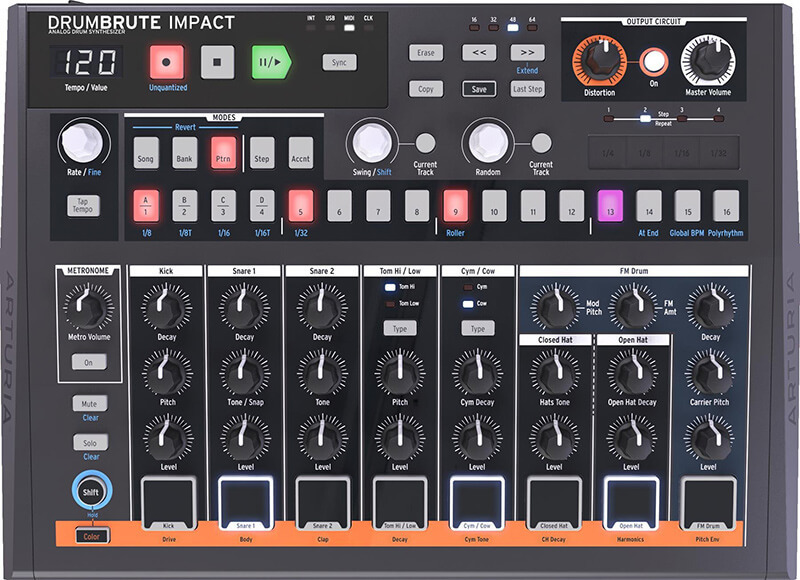 Though they may share similarities in both namesake and function, it’s important to note that Arturia’s newly launched DrumBrute Impact is an entirely different beast, one that extends far beyond the reduced footprint and price tag. You’ll find dedicated circuits for kick, two snares, toms, cymbal or cowbell, closed and open hats plus a versatile FM synthesis channel. Add in the excellent step sequencer, output distortion and an extremely intuitive user interface and it amounts to something of a bargain at a very reasonable £279, a full £100 less than the original DrumBrute. Roland’s TR-808, released in 1980 and discontinued three years later, remains one of the all time classic analogue drum machines. The TR-08 is a modern take on the classic sound, this time recreated digitally using Roland’s Analogue Circuit Behaviour (ACB) technology. Deep, booming kick drums and sizzling hi-hats are a speciality. It’s very, very close to the sound of the real thing for a fraction of the price. If the 808 defined the iconic sound of old-school hip-hop and electro, its follow up, the TR-909, was undoubtedly the drum machine that made the biggest impact on house and techno. No prizes for guessing the TR-09 is to the 909 as the TR-08 is to the 808: it’s punchy, brash and in-your-face. Roland’s Boutique machines take up two slots on our list (how could we pick one without the other?!) but at a slightly higher price point the TR-8 and TR-8S are also well worth a look. 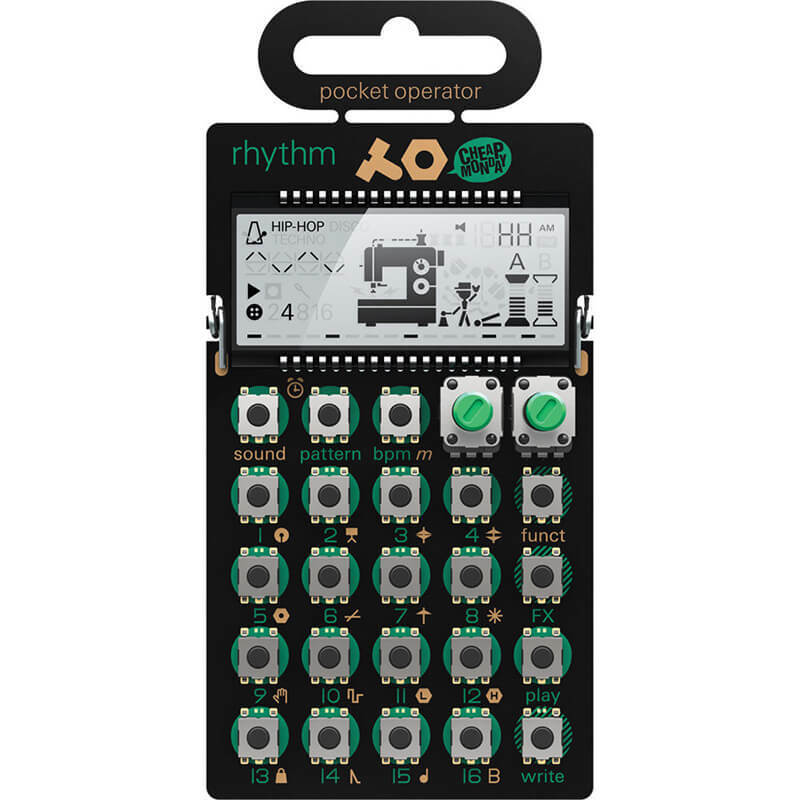 Teenage Engineering’s Pocket Operator range is all about blurring the lines between toys and instruments. The low price and bare bones calculator-style appearance might suggest that they’re not to be taken seriously, but a few minutes prodding their tiny buttons will convince you they’re not to be dismissed as serious music-making tools. There are now a grand total of nine options in the range, with the PO-12 being the company’s original drum machine. Alternatively, the PO-24 Office model does noise percussion, while the PO-32 Tonic is a slightly more expensive option which works in conjunction with Sonic Charge’s excellent Microtonic plug-in. 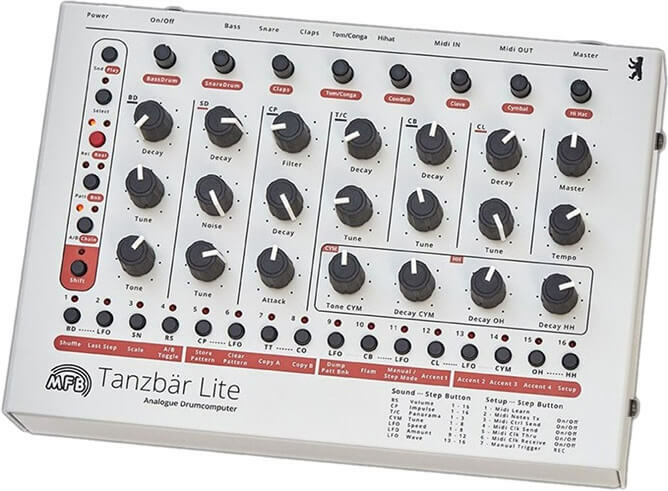 MFB’s Tanzbär Lite is still much more affordable than high-end options such as the DSI Tempest or Elektron Analog Rytm, but it’s a very serious bit of kit for the money. It’s a successor to the German company’s 522 module, which was loosely inspired by the Roland TR-808, but it’s got a distinctive sound rather than being an imitation of something else. Workflow and build quality are slightly lacking compared to more expensive models, but the sound stands up to anything else on the market.